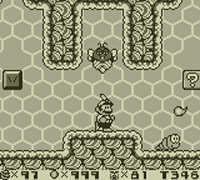 While Mario was in Sarasa Land during Super Mario Land, his greedy rival Wario stole his castle and hypnotised the residents of Mario Land to obey him. Wario locked himself in the castle and gave the 6 Golden Coins to his strongest friends. 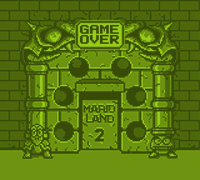 Your have to get the 6 Golden Coins back from the six Zones of Mario Land to unlock the castle and overthrow Wario. Mario can collect Power-Ups to help him, including the new Carrot, giving him rabbit ears that slow his descent during a jump or fall. There are secret stages that can be unlocked by finding hidden doors in certain areas. Lose all your lives and wait around on the Game Over screen for a few minutes. Eventually the music will stop and Totaka's Song will play. On the final stage of Mario Zone, the entire stage is made up of toy building blocks similar to Lego. 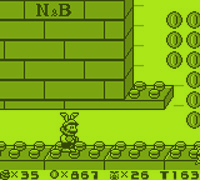 Around halfway through the level there is a split path, and along the lower path one of the blocks reads "N&B". N&B Block was Nintendo's own Lego-style building block brand when they were a toy manufacturer in the 1960's and 70's. Throughout the game are sea urchin enemies floating in the air that wiggle around as you approach. This enemy's sprite seems to be identical to the sprite of Gordo, a similar enemy in Kirby's Dream Land.